Everyone enjoys the great food, cookies, dressing up, time spent with friends and family, and all the traditions of the holiday season. For the Charlotte hair stylists at Paul Beauné, one of our favorite parts of the holidays are helping our clients achieve the fun, elegant, sparkly hairstyles and holiday hair trends to top off their party dresses. This season, choose from one of the following on-trend styles or let our professionals help you create one of your own. Natural – You’ve got it; flaunt it. A style featuring your natural texture and cut sometimes makes the perfect complement to the rest of your party look. To best showcase, your natural self, eliminate split ends and update your style with a great wash and wear cut. Our hair stylists in Charlotte can help you select the perfect cut to feature your hair’s natural texture while complementing your unique features. Keeping your hairstyle simple and natural allows the rest of your look to enhance your natural beauty. View an example, here. Sparkle – Holiday parties are the perfect setting for a little extra sparkle. Set against a backdrop of dazzling decorations, a few tastefully placed jewels throughout your hair will make sure you shine as brightly as the room. Secure jeweled pins throughout braids, in a chignon, or select a glittering comb to sweep hair away from your face with style. View an example, here. Half Up – This style offers both romance and practicality by keeping hair off of the face while still showcasing your length and cascading layers. A half up do also offers versatility; hair can be pinned back in braids, twists, or into a small textured bun. View an example, here. 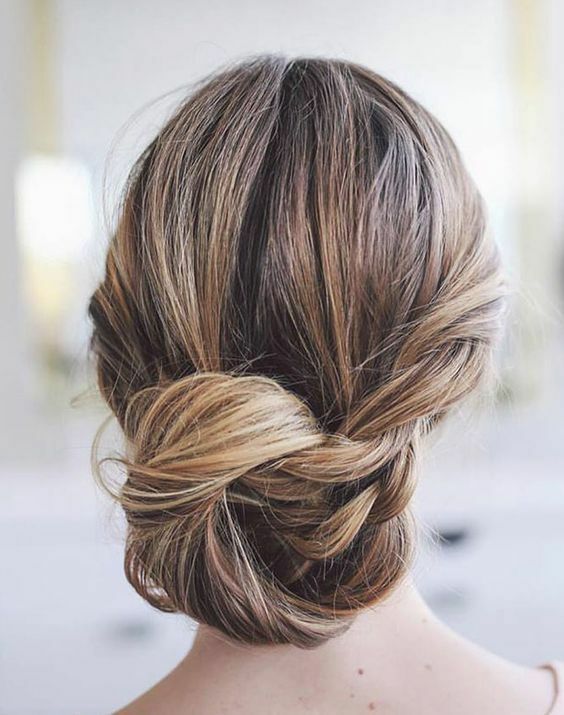 Chignon – An elegant version of a classic bun, the chignon is worn low at the nape of the neck. To get the look, gather your hair at the neck and twist into a coiled, circular shape. Use large bobby pins to secure on either side. Pull hair at edges to loosen the coil and create the desired shape. Elevate the look with added texture and braids. View an example, here. Go-Go Volume – The 1960’s sky-high volume has made a comeback this holiday season. To create a beehive look, first set and curl your hair with large roller curlers. Once curled, separate the top section of your hair for teasing. Back-comb the hair around the crown of your head. Then smooth hair back with a boar bristle brush for a smooth look. Spritz your hairdo with hairspray strong enough to keep your look from falling. Our Charlotte hair stylists can help you find the right styling tools to ensure you achieve this long-forgotten style. Finish the look with a fab headband – preferably with lots of sparkle for a complete, retro-inspired holiday style. View an example, here. Soft Waves – Elegant, soft waves are perfect for a classically sophisticated holiday party look. Use a large-barreled curling iron or rollers to curl and set hair. Gently pull out tight curls to create soft waves and arrange them to cascade around your face. For added drama, create a deep side part, sweeping most of your waves to one side. Worn in either short or long hair, waves highlight your hair’s shine and luminosity. View an example, here. Modern Twist – When you think of the French twist, you probably think of all the bridesmaids whoever paired French twists with puffy sleeves in the 1980s and ’90s. This contemporary take on a classic French twist, however, gives the style an edgier look. Add volume in the front, slick back the sides, and skip the curly tendrils, which make the style feel dated. Secure with basic pins or add a few encrusted with sparkle to give the sleek look a soft, surprising touch when viewed from behind. View an example, here. Side Braid – A step up from a sleek, slicked-back look, the side braid adds an element of surprise and femininity to an otherwise, edgy style. You can add this versatile look to almost any hairstyle worn down: soft waves, wet, slicked back, or side swept. The side braid is also a perfect solution for showing off both your hair and a great pair of earrings. View an example, here. Fringe – Decorate your face for the holidays with a brand-new look that will take you into the new year with a freshly updated style. Add bangs (or should we call them tinsel?). Bangs come in various styles: blunt, side-swept, choppy, parted, and arched. With so many variations to choose from, selecting the right style for your look, face shape and personality can be a tough choice. A Paul Beauné hair stylist in Charlotte can help you choose the type which will best complement your features. View an example, here. Elegant Flapper – The finger waves of the 1920s and ’30s should never have gone out of style. Thankfully, these fun and sophisticated waves are on-trend this holiday season. Whether you have long locks or a bob reminiscent of the jazz era, these elegant waves can work for you. To create the style at home, begin with freshly washed, towel-dried hair. Apply a strong hold gel before creating a deep side part. Place a wave clip next to your part. Then, press the length of your hair toward the clip to create a wave. Apply another clip beneath the wave to hold in place and continue this process, waving hair until you reach your ears. Let your hair dry with the clips in place and style the lengths of the hair. Remove clips and enjoy. View an example, here. Choosing the perfect hairstyle for your holiday look can be difficult when there are so many to choose from. If you are not sure which style will work the best for you, our hair stylists in Charlotte can help you select a hairstyle which will work well with your unique hair texture, your haircut, your makeup, and your prettiest party dress.